Welcome to "A Haunted Halloween" Giveaway Hop hosted by Mommy's Favorite Things and Mama's Baby Cupcakes. This hop is focused on items you'd want/need for Halloween. 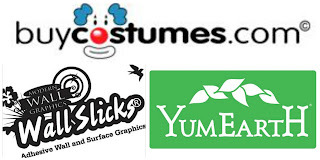 Whether its costumes, decorations, or candy, I'm sure you'll enjoy what all the bloggers have to offer. After visiting my giveaway, make sure you use the linky below to take a look at what the other blogs have to offer! Each blog has a minimum prize package of $25 per winner. She specializes in wooden gifts and personalized items. She also has cute little Holiday Decorations too. Her decorations are so cute and so perfect. I love the holiday ones for decorating. They are perfect. And even though they don't last too long during the year (1-3 months), they are made of wood so they can be used year, after year, after year! So they are a long time part in your decorations. Her prices are pretty awesome too. $29 for the Happy Halloween above. $30 for the Pumpkin, Mummy, Ghost and Frankenstein. Frosty is only $22! And the wedding one is $26. Her prices are pretty awesome. She also make some for every day and also does birth announcement ones for the nursery as well. For the Giveaway, Faye's Attic11 is offering the below Witch Hat which is worth $23. 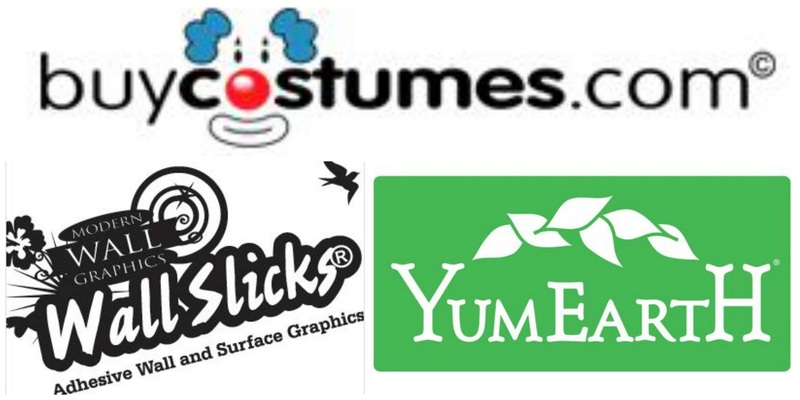 Mama's Baby Cupcakes, Mommy's Favorite Things and the "A Haunted Halloween" participating bloggers are not responsible for sponsors who don't fulfill prize obligations. I love the life's greatest blessing grandparent blocks! i love the "i have always known it was you" block set! I like the Christmas snowman rustic family. I love the Zombie Avenue decoration! I like the bathroom wooden sign. I think the primitive Halloween decoration is my favorite. It's so awesome!! I like the Christmas Snowman Rustic family shabby chic Let it snow snowman family with fabric hats and scarves buttons country rustic decor decoration. I like The Zombie Ave. for Halloween Deco! Too Cute! I like the blessings block with the 3 pictures on it. 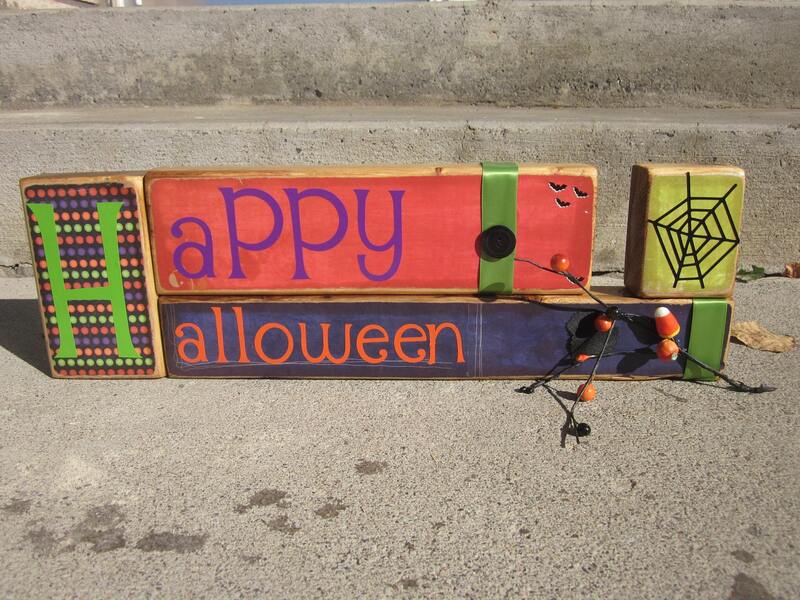 I like the Halloween pumpkin wooden blocks. I like the Zombie Ave. sign! I absolutely love the Cinderella is proof that a new pair of shoes can change your life! I love the Fall Thanksgiving primitive rustic decoration! I likethe : Thanksgiving decoration for the holidays fall decor pilgrim hats orange and brown turkey pumpkin pie gobble gobble. I like the Fall/Autumn decor wooden stacker scarecrow falling leaves welcome autumn red green yellow brown wooden blocks with vinyl leaves Rustic. Fall is my favorite time of year! I love the Personalized Wedding gift/Decoration Happily Ever After! 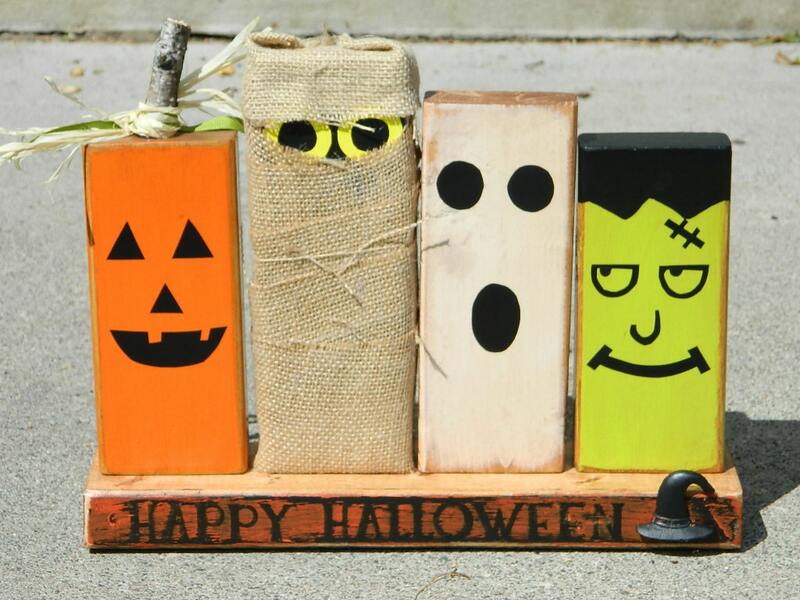 I love the Primitive Halloween decoration with wooden monsters! I like the Wooden Bath sign. I like the wedding gift. I like the Winter Blocks with the Snowman. the 'zombie' blocks...my son will go crazy over this. I love the Winter Blocks with snowman Christmas decoration blue Christmas with wooden snowman cut out frosty the snowman. Her decor is so cute! These are so cute! I like the gobble till you wobble! I love the wedding blocks "And they lived happily ever after". They are all so cute though it'd be hard to pick one! I absolutely love the Fall/Autumn pumpkins primitive decoration! I love you to the moon and back wedding stacker is my favorite. I like the "Fall decoration wooden blocks primitive pumpkins thanksgiving halloween red orange brown crisp apple pumpkin patch primitive center piece". I like the Tis the Season decor. 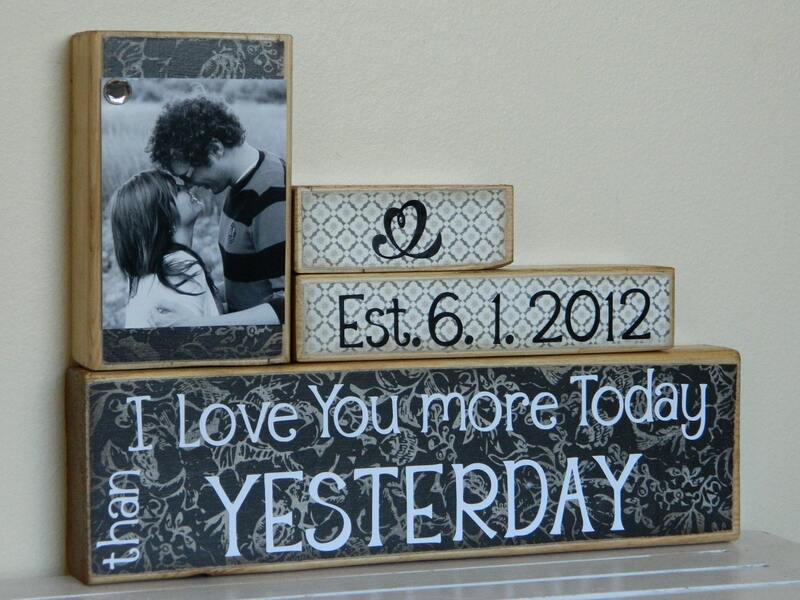 I like the Personalized Wedding gift/Decoration Happily Ever After wedding, shower, anniversary, Valentines Day gift. Love the Father's Day blocks & the Snowmen! Personalized Wedding gift/Decoration Happily Ever After wedding, shower, anniversary, Valentines Day gift for a friend. She has so many nice ones that I am torn. I think my favorite is when a child is born so is a grandmother. I love the fall decoration wooden blocks primitive pumpkins thanksgiving halloween red orange brown crisp apple pumpkin patch primitive center piece!! I love the Zombie Halloween decoration, because I love Zombies!!! I like the Fall/Thanksgiving primitive rustic decoration that says "Give Thanks"
I like the Christmas Snowman Rustic Family. I am going to order one for my mom. I like the greatest blessings blocks! I don't have much decor for Thanksgiving so I really like the Thanksgiving decoration for the holidays fall decor pilgrim hats orange and brown turkey pumpkin pie gobble gobble. I like the Zombie Halloween decoration shabby chic green and black. The blocks with MERRY CHRISTMAS. The 5 pieces standing up look like wrapped present and the cheery colors make me smile. Thank you for introduction to a wonderful Etsy shop, and for the opportunity to win. Aloha. Lots of beautiful pieces. I like the Personalized I love you to the moon and back wedding stacker. Thanks. I love the Zombie Halloween decoration shabby chic green and black! Very cute stuff! I like the Zombie Ave Board!! I really love the Christmas decoration for the home or gift Tis the season to be jolly primitive Christmas red and green candy cane stripes. I like the zombie avenue sign. I love the frosty the snow man wooden blocks. Besides the signs you've shown and reviewed here, I like the wooden blocks BATH sign. I love them all, but I am unsure of whether or not I would give it as a gift, and that makes a whole complete difference! I like the Zombie Ave sign. Love the Grandparents Christmas gift blocks - cute stuff! I like the Personalized Wedding gift decoration and they lived happily Ever after shabby chic wood anniversary wedding shower gift black and white! 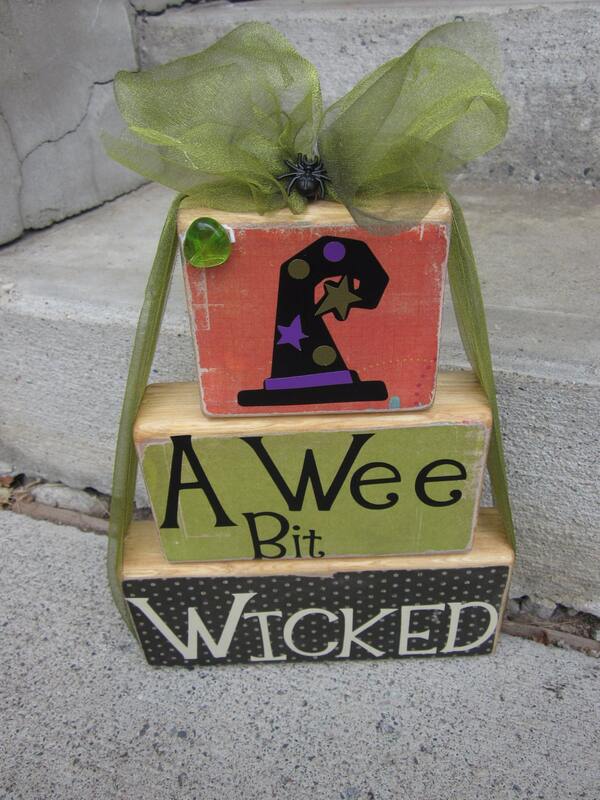 I like the winter blocks with the snowman as the i and the wee bit wicked halloween witch blocks! I like Gobble til you wobble. i like "i love you to the moon and back"
I love the Personalized Wedding gift/Decoration Happily Ever After wedding, shower, anniversary, Christmas black and white wedding shabby chic sign! I would love to have the Wooden Bath sign. I like the gobble til you wobble sign. I also like the When a child is born so is a grandmother. I really like the I love you to the moon and back. I like the personalized I love you to the moon and back sign. I like The Zombie Ave. Decoration! I love their Christmas Snowman Rustic family shabby chic...adorable! 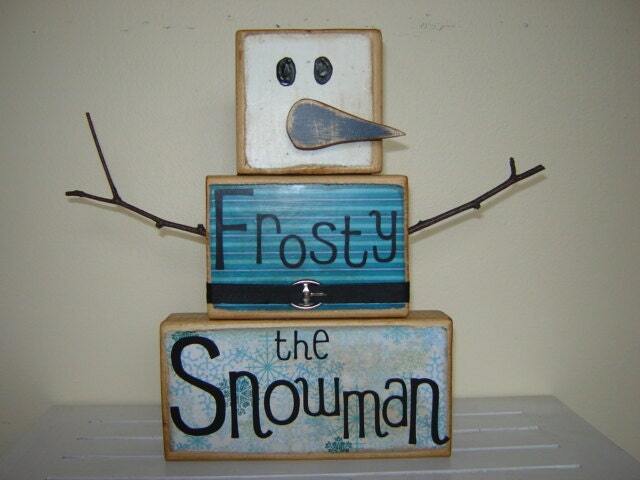 I would love to have the Frosty the Snowman wooden block primitive Christmas decoration, it is so rustic and cute. I love the Zombie Halloween decoration shabby chic green and black happy halloween! I really like the Christmas Snowman Rustic family . I like the Mr and Mrs Wedding decoration black painted wooden blocks shabby chic vintage wedding personalized photo Christmas gift. I think the Gobble til ya wobble sign is really cute. Thanks for having this contest. I love the Zombie Ave sign!